Hanseswari temple is a Hindu Temple of goddess kali in the town of Banshberia at Hooghly District, Indian state of West Bengal. Basberia presently an industrial town positioned in between Bandel and Tribeni. The temple complex has another temple — Ananta Basudeba temple — besides the main temple. 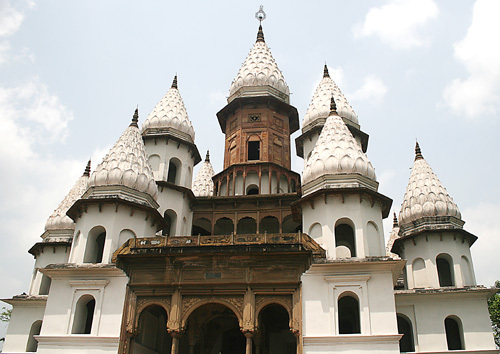 Also near is the Swanbhaba Kali temple built by Raja Nrisinhadeb Roy Mahasay in 1788. The Hanseswari temple has a distinctive architecture different from the usual pattern present in this area, consisting 13 minars or Ratnas, each built as a blooming lotus bud. The inner structure of the building resembles human anatomy.It was started by Raja Nrishinghadeb Roy Mahasay and later completed by his widow wife Rani Sankari. Dates back to the 19th century with ornate arches. The main deity is the blue neem-wood idol of the four-armed goddess Hanseswari, a manifestation of Goddess Kali.The temple is 21 m high and has 13 towers. The peak of each tower is shaped as a lotus flower. Built according to Tantric principles, this five-storey shrine follows the structure of a human body - Ira, Pingala, Bajraksha, Sushumna and Chitrini. The architecture of the temples is the representation of "Tantrik Satchakrabhed".